Bold markings make this fish very attractive. Note also the saw-like edges to the gill cover. I’ve had a long standing interest in the bicinctus clown (Amphiprion bicinctus), I think in the main because it was the first clown I ever saw in the wild and the one that I’ve photographed the most and of course the one I’ve enjoyed watching in the wild the most. This is partly due to geography, after all I’ve spent much of my scuba diving life in the Red Sea and if you’re in that fascinating part of the world then bicinctus is the pretty much the only Amphiprion species you will see. 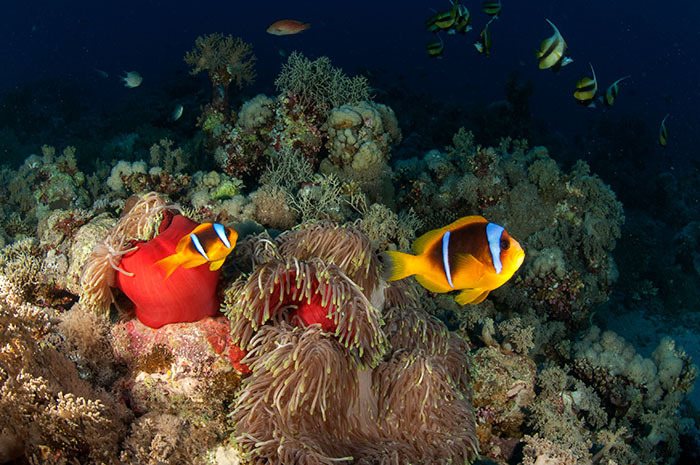 A. omanensis can be found from the Gulf of Aden and the Yemeni coast and A. sebaefrom the Gulfs of Aden and Oman and then into the Western Pacific, but bicinctus is the clown that visitors to the Red Sea will see and of course the species chosen for use in Red Sea biotope aquaria. 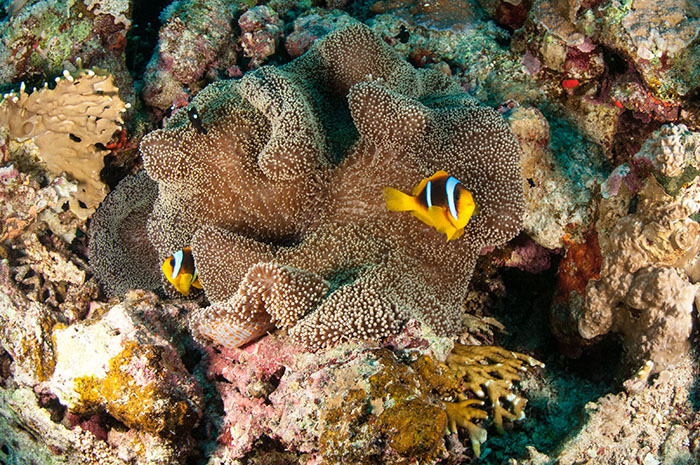 Amphiprion bicinctus with H. magnifica. Some (perhaps older sources say that A. bicinctus is also found in the Chagos Archipelago, but I have always understood this to be the closely related and similar looking A. chagosensis, that I would dearly love to photograph in the wild. This sort of scene is inspiring many Red Sea biotope systems. For me, the Clarkii complex of clowns, which includes bicinctus, is the most generally attractive. I am perhaps a little old fashioned in that I prefer the ‘natural’ clowns over the modern morphs, though I acknowledge the work and the commitment that has gone into raising the new varieties and of course recognise the value that captive bred fish are bringing to the hobby and its reputation that has been and occasionally is, less than ecologically and ethically sound. For me, though nature has done a great job with the Clarkii complex. 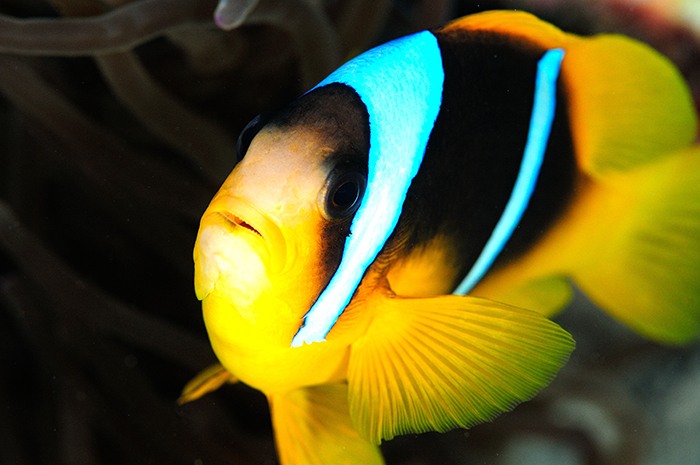 Amphiprion bicinctus, if we examine the binomial means: Amphi ‘both sides’ prion‘saw,’ referring to the serrated edge of the gill covering in the genus, bicinctusliterally means ‘twice cut’ referring to the clearly defined white stripes that do indeed appear to split the fish into three. These white bands are edged in black and are very noticeable and reflective underwater. Indeed bicinctus is often visible several metres away as it hovers in the water column over its host anemone, which makes it so easily spotted by divers. 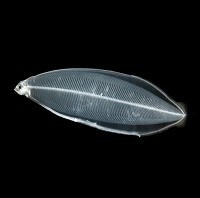 I have long suspected that it is one of the most ‘confident’ of its genus and have noted that it does seem to be a very ebullient fish and have regularly been attacked and bitten by these feisty animals as they try to scare away the huge creature with a nine inch wide mouth that is bearing down on them. 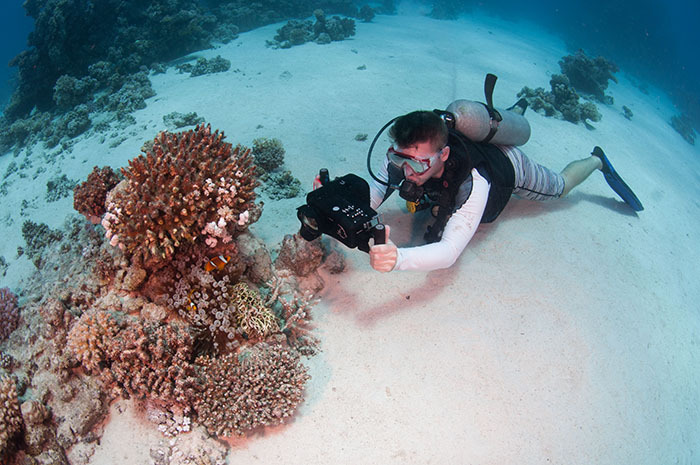 I refer of course to the dome port on my camera housing, which has been alternately attacked by the fish and then occasionally cleaned by the small commensal shrimps that live within the anemones also. 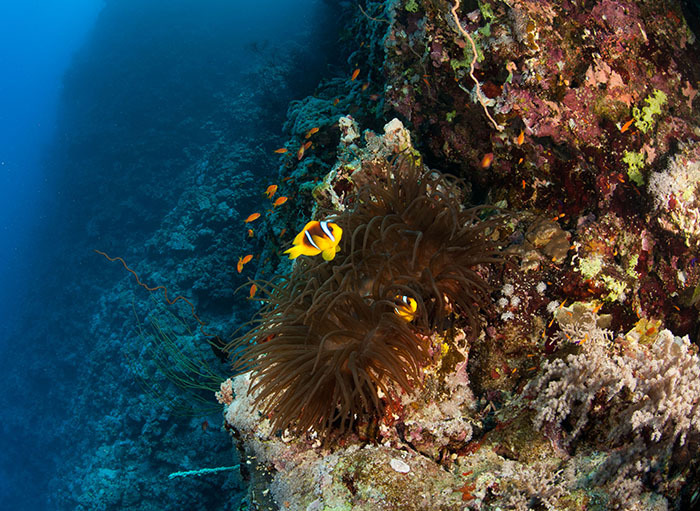 On a recent trip I think I came across the most bad tempered and most aggressive clownfish in the Red Sea. Mostly clowns will retreat into their hosts and make rapid sorties outwards to chase away predators, well not this fish. I could not tempt it back into its host where it could be photographed in situ, in the ‘classic’ clownfish photograph. Instead this relentless creature just kept on attacking me, biting my fingers, and camera. It didn’t hurt at all, but it was very impressive. I’m probably reading too much into it, but the fish was alone in its host (not a common situation) and the anemone, which was a large (Entacmaea crispa), was attached to a reef wall at around ten metres in depth and was suffering from a constant ‘rain’ of sand and detritus, which was moving down the reef from a crack in the reef structure above. I’ve no knowledge of whether this meant that occasional items of food would then be available in this ‘rain’ for the ‘nem, but I decided (without any scientific justification), that the constant nuisances of the falling sand made the ‘house proud’ clown enormously frustrated. 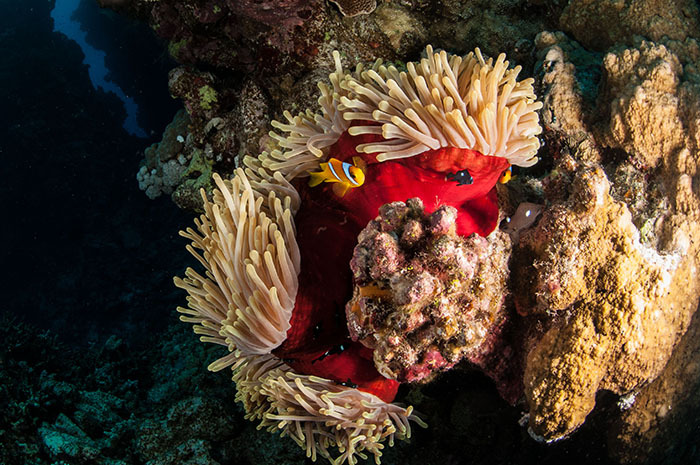 Incidentally I have heard audio recordings of clown fish ‘grunting’ as part of their response to threats, though have never discerned this sound myself underwater. Is this the angriest fish in the Red Sea? Normally I would remove the ‘blobs’ caused by the ‘rain’ of sand particles in Photoshop, but I’ve left them in to show what the fish has to deal with. Note the three orchid Dottybacks in the left of the image. Another Red Sea favourite. Their bright colours, characterful personalities and the ease with which they can be corralled into their hosts has meant that bicinctus has become a favourite with divers and very often fish geeks like me have to cringe a little when back on deck as someone says “ooh wasn’t the nemo lovely.” A well-positioned anemone can attract a great deal of attention, and I sometimes wonder if it is less than ideal for the fish involved. Whilst I may joke about fish attacking me I wonder what damage the stress may do? 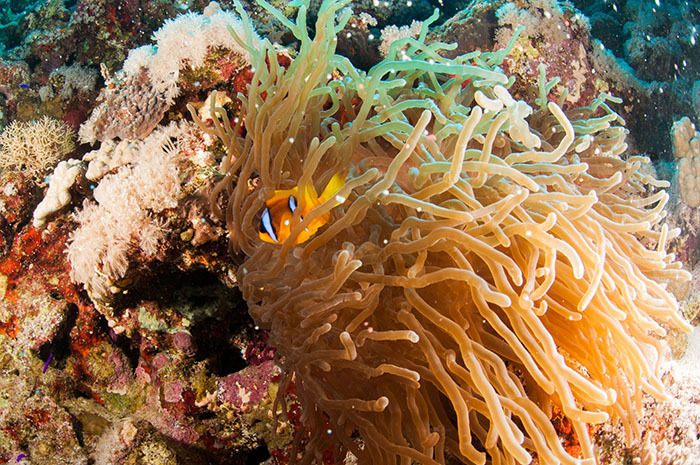 I have seen some clowns nip at their anemone hosts when I’ve been shooting them – is this a response to my presence? I’d be interested to know. Videography of clowns in E. quadricolor. Bicinctus clowns show quite a degree of variation in colouration, some, often younger fish are far more orange, whilst others, often the larger ones have a greater degree of brown, though never the black of some of their relatives. 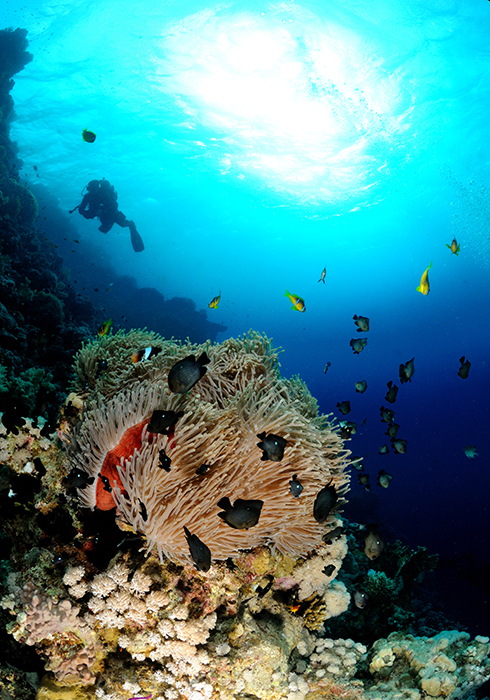 A typical scene in the Red Sea. My flash guns have illuminated the foreground to bring out the ‘true’ colours. Some E. crispa anemones are red, though typically they are brown like this one. A very attractive E. quadricolor. Note the commensal shrimps at bottom right. Bicinctus clowns are found in several species of anemone, Entacmaea crispa and E. quadricolor and Heteractis magnifica appear, as far as I can see, to be the commonest anemone species in the Red Sea and are in the majority of cases occupied by a pair of bicinctus clowns or a group of juveniles. 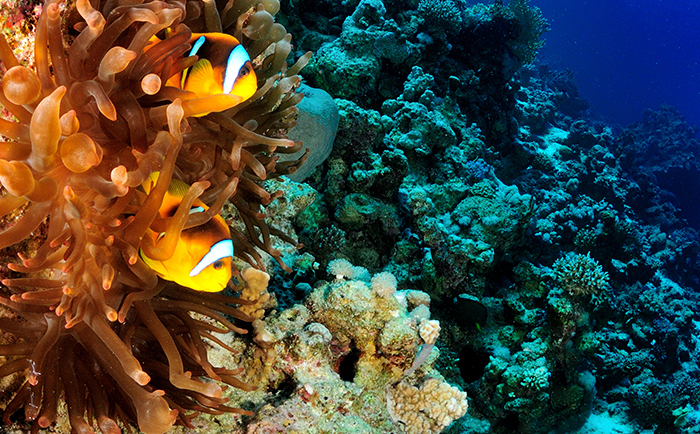 Where groups of anemones occur, as is often the case with H. magnifica, a number of clowns can gather in one area. I’ve also seen bicinctus in Stichodactyla haddoni and Heteractis aurora in fewer numbers. So if you wish to create an accurate biotope then I’d pick an E. quadricolor (as it is most representative in my view). H. magnifica is attractive, but just seems to get too big for most aquaria. A pair of bicinctus in S. haddoni. Note the Dascyllus trimaculatus above the left hand fish and the tiny damsel to the right of the right hand fish. Bicinctus clowns often share their hosts with other species, this ranges from small Periclimenes shrimps to other fish, namely the three spot damsel Dascyllus trimaculatus. D. trimaculatus is not necessarily a fish we want in our aquaria, when young it is harmless and undeniably attractive, but as it matures it becomes a little bugger (as we’d say in my part of the UK) and in my opinion should never be sold. Sadly they are often sold by less than responsible dealers to newbies who buy them as they are cheap, easy to keep and cute. It appears that bicinctus tolerate D. trimaculatus until they are breeding and will then oust any and all other residents barring shrimp, though I have only my own experience to base this assumption upon. Two young bicinctus in an H. magnifica with several young D. trimaculatus. 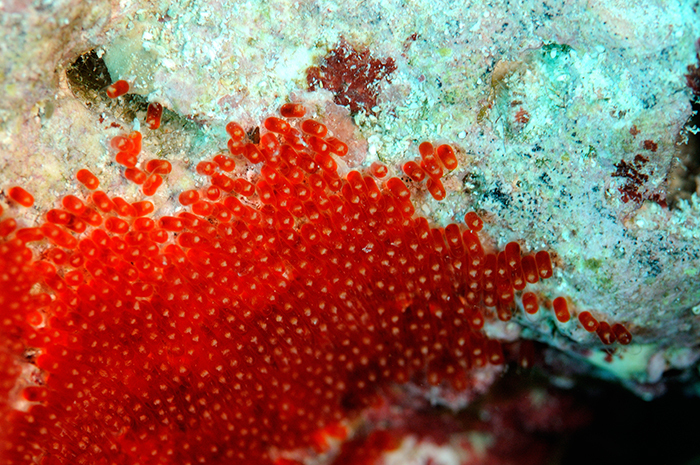 Bicinctus will lay 500-1,500 sticky eggs on a patch of cleared rock near the base of the host anemone and will defend them vigorously, they are reported to be cared for by the male fish only, with the larger fish being the female as is typical in the genus. 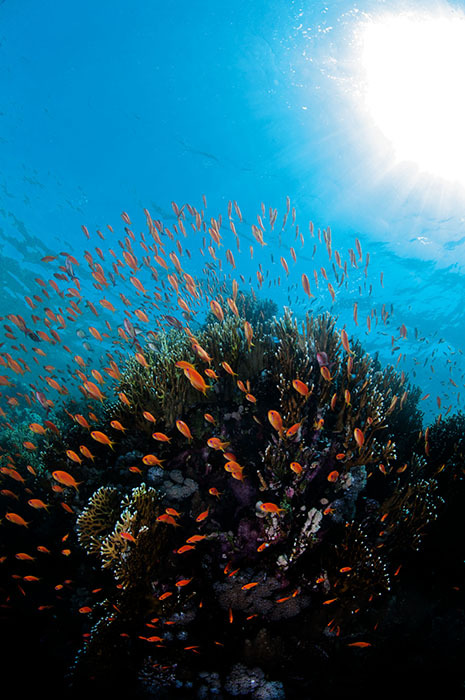 In the Red Sea spawning occurs after the full moon, mainly in the warmer months of the year. The eggs hatch after roughly a week before the larvae drift in the plankton for just over two weeks before settling and seeking a host anemone. Clearly the overwhelming majority of post larval fish are lost as you NEVER see a clown without an anemone. Whilst anemones are most commonly seen on the reef, they are also seen on shipwrecks which makes for interesting photography. The anemones of course merely settle where the conditions are right, whether they are attached to rock and dead coral or to iron and steel. 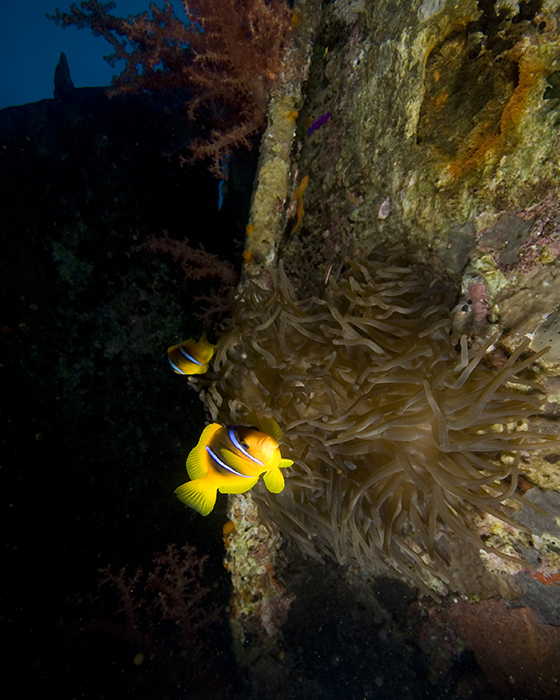 Incidentally I have read that clownfish are not found at depth due to the light requirements of their hosts. However I’ve seen E. crispa (with bicinctus clowns) at very nearly 40 metres on a shipwreck. Bicinctus in Captivity I haven’t yet seen bicinctus clowns in the UK, they may well be around, but I’ve perhaps just missed them, but I am told they are available in the States with companies like ORA breeding them in good numbers. This is undoubtedly a good thing. I would though draw a word of caution: as noted these can be territorial fish, so if you do invest in some and a pair results, and if they choose to lay as they will easily do, do expect them to defend their ‘home’ vigorously. In a small tank they may become troublesome to other species. Apart from that I understand from what I’ve seen online and in magazines that they are easily kept and hardy, though, perhaps oddly, I have yet to keep the fish myself. They do not absolutely require an anemone in captivity but if you can support one in your tank then the fish will reward you with natural behaviour. As mentioned before I’d look towards a Bubble tip (E. quadricolor) and try to source one that has been generated from division from an already captive line. In captivity the fishes can grow to four inches or so and will accept flake and frozen foods. Partner them with Orchid Dottyback, a shoal of Lyretail Anthias and a Red Sea biotope will be yours!